LETTER 43 February/March 2018 unmanned systems inside OPTION 1 WOULD REQUIRE TRACKING AND ID FOR ALL DRONES EXCEPT: • Those f lying only within the line of sight of its remote pilot and not designed to be able to f ly more than 400 feet away from the pilot. • Racing drones on a closed, low-altitude course. • Model aircraft unless they can do way-point navigation without continuous pilot input or have a real-time, downlinked remote sensor that provides the pilot the ability to navigate the aircraft beyond his/her visual line of sight. OPTION 2 WOULD REQUIRE REMOTE ID AND TRACKING CAPABILITY FOR UAS WITH EITHER OF THE FOLLOWING: • The ability to navigate between more than one point without direct and active control of the pilot. • The range from a control station is greater than 400' and there is a real-time remotely viewable sensor capability. These options, however, simply ignored the real bone of contention—whether the weight of the drone should be used to determine risk and how to handle model aircraft. 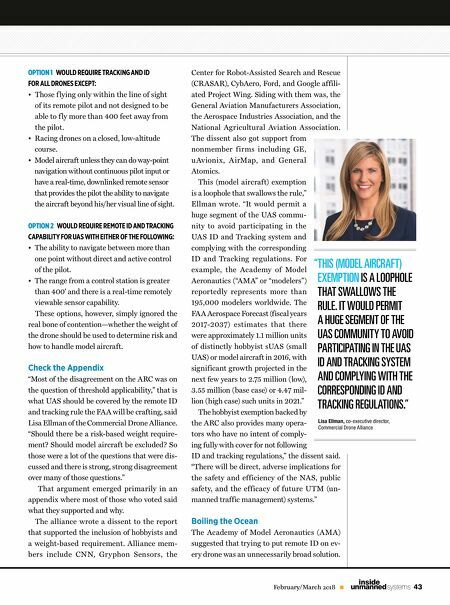 Check the Appendix "Most of the disagreement on the ARC was on the question of threshold applicability," that is what UAS should be covered by the remote ID and tracking rule the FAA will be crafting, said Lisa Ellman of the Commercial Drone Alliance. "Should there be a risk-based weight require- ment? Should model aircraft be excluded? So those were a lot of the questions that were dis- cussed and there is strong, strong disagreement over many of those questions." That argument emerged primarily in an appendix where most of those who voted said what they supported and why. The alliance wrote a dissent to the report that supported the inclusion of hobbyists and a weight-based requirement. Alliance mem- bers include CN N, Gr y phon Sensors, the Center for Robot-Assisted Search and Rescue (CRASAR), CybAero, Ford, and Google affili- ated Project Wing. Siding with them was, the General Aviation Manufacturers Association, the Aerospace Industries Association, and the National Agricultural Aviation Association. The dissent also got support from nonmember f irms including GE, u Av ionix, A irMap, and General Atomics. This (model aircraft) exemption is a loophole that swallows the rule," Ellman wrote. "It would permit a huge segment of the UAS commu- nity to avoid participating in the UAS ID and Tracking system and complying with the corresponding ID and Tracking regulations. For example, the Academy of Model Aeronautics ("AMA" or "modelers") reportedly represents more than 195,000 modelers worldwide. The FAA Aerospace Forecast (fiscal years 2017-2037) estimates that there were approximately 1.1 million units of distinctly hobbyist sUAS (small UAS) or model aircraft in 2016, with significant growth projected in the next few years to 2.75 million (low), 3.55 million (base case) or 4.47 mil- lion (high case) such units in 2021." The hobbyist exemption backed by the ARC also provides many opera- tors who have no intent of comply- ing fully with cover for not following ID and tracking regulations," the dissent said. "There will be direct, adverse implications for the safety and efficiency of the NAS, public safety, and the efficacy of future UTM (un- manned traffic management) systems." Boiling the Ocean The Academy of Model Aeronautics (AMA) suggested that trying to put remote ID on ev- ery drone was an unnecessarily broad solution. Lisa Ellman, co-executive director, Commercial Drone Alliance " THIS (MODEL AIRCRAFT) EXEMPTION IS A LOOPHOLE THAT SWALLOWS THE RULE. 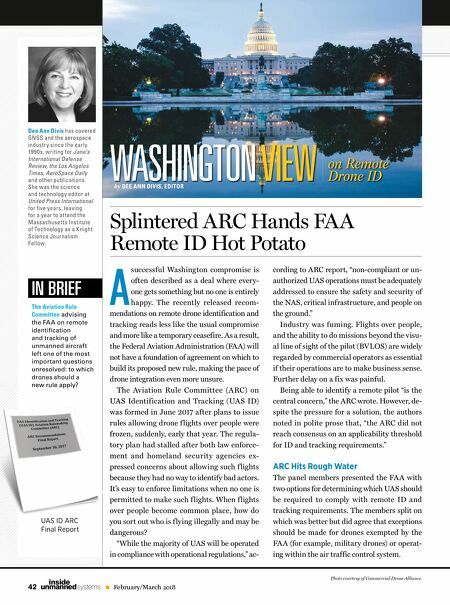 IT WOULD PERMIT A HUGE SEGMENT OF THE UAS COMMUNITY TO AVOID PARTICIPATING IN THE UAS ID AND TRACKING SYSTEM AND COMPLYING WITH THE CORRESPONDING ID AND TRACKING REGULATIONS."